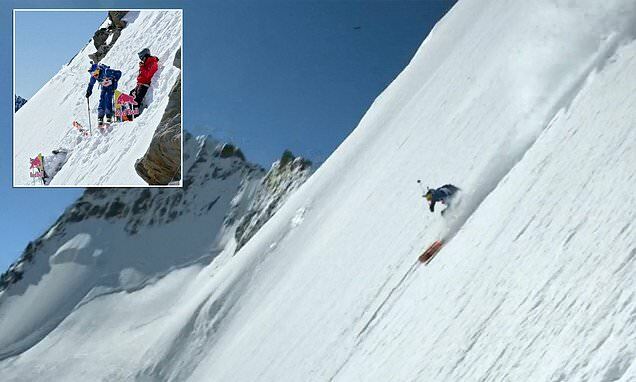 Two skiers slalomed down a steep 13,841 feet mountain face as part of 'Race the Face' - a concept to see how quickly one can ski the whole mountain. Daron Rahlves, a former Alpine world champion, and Jeremie Heitz, a celebrated freeskier, raced down a giant slalom on the face of the Hohberghorn in Switzerland. Heitz came up with the race idea, which saw the pair ski downhill, whilst filming a documentary about the toughest descents in the Alps. The pair had to wait more than a month for the perfect snow to collect on the glacial front of the mountain. They then faced a tough climb, using ice axes, ropes and crampons, to set-up gates for the race. U.S. competitor, Rahlves, skied first, clocking in a time of 26.440 seconds.